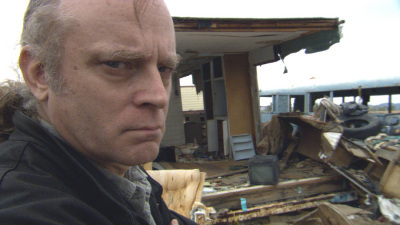 Brad Dourif acts as the narrator and sole fictional character of Herzog’s film. I’d say he’s the #1 overlooked screen actor in the country and he’s why I plan on seeing the film as soon as I possibly can. Extra points for him playing an alien. You probably don’t recognize the name. You may recognize the face, however, as that of Grima Wormtongue in The Lord of the Rings: The Two Towers, and you may recognize his voice as that of the evil doll Chucky in all his many incarnations. He also pulled off an amazing performance as Billy Bibbit in One Flew Over the Cuckoo’s Nest, for which he won a Golden Globe. I first saw him as the villain Saavedro in the computer game Myst III, where he creates a surprisingly emotive and complex character (and is one of the few good things about the game). At this point, though, you’re getting a little tired of me waxing lyrical about some small-time TV actor with a couple film performances under his belt. If you were sitting next to me right now you might smack me upside the head, if you’re the kind of person who does such things. “So why’s he so great what with him being in such unremarkable movies?” you might ask (grammatically incorrect, as usual). Paul you moron, I would then opine (I’m not talking JUST to you, Paul; since you’re the most frequent commenter here you get the honor of being the namesake of all theoretical anonymous imbeciles appearing in my blog entries), All you have to do is watch One Flew Over the Cuckoo’s Nest and The Two Towers back-to-back to see. This guy has an unparalleled intensity. More than that, though, is that he can use stereotypes against themselves. Billy Bibbit is the typical stuttering kid with low self-esteem, but it’s precisely BECAUSE of this that his performance is so powerful. Grima Wormtongue is a sniveling, subordinate bad guy—complex precisely BECAUSE he lacks complexity. (incidentally, his brief appearance in the extended edition of Return of the King creates a very nice character arc) That, Paul, is why Brad Dourif is an amazing actor, I would conclude, and if you can’t see that I just don’t think we can go on being friends. Anyway, Brad Dourif is the world’s best character actor, and if I ever get word that he and Steven Wright will be appearing in a Terry Gilliam movie co-written by Tom Stoppard I will have to be revived with the aid of old-timey smelling salts.